The loin of a pig is a magnificent cut of meat, a dense strip of heavy meat flanked by part of the belly and encased in skin destined to crackle, nested in a cradle of bones. As a joint, this has everything. Preparation is simple, and the most important parts happen in the butcher’s shop. Ask for a pork loin, about 3.5 to 4kg, on the bone, the skin scored. My butcher didn’t have a big enough loin to hand, so he butchered a new pig for me. I love these moments…a quick discussion, an understanding, a disappearance into the back room, much sawing, blows from the cleaver, a reappearance, full loin hefted over a shoulder, to be smacked down onto the block, all four feet of it. I left with about a quarter of the loin. Ask the butcher to take the loin off the bone, but make sure you buy the bones as well. They’re very much a part of the dish. At home, grind a couple of teaspoons of fennel seeds, a teaspoon of dried, flaked chillis and a teaspoon of salt in a pestle of mortar or an old coffee grinder. Mix in the zest of a lemon. Sprinkle the seasoning all over the flesh side of the joint. Don’t let it get onto the skin. Rub the seasoning into all the nooks and crannies. Lay some bay leaves, four or five, onto the middle of the joint and roll the belly over as tightly as you can, tying it up with string. There are proper methods and techniques for tying a joint. i use trial and error, and I’ve found it useful to have an extra hand available to help get the first few knots tight. Lay the rack of ribs in the bottom of a large roasting tin and lay the rolled joint on top. Rub a little olive oil into the skin and sprinkle with salt. Put the joint into the oven, which should be preheated to it’s absolute maximum temperature. As soon as the meat is in, turn the heat down to 180c. The initial blast of heat will set the crackling. The joint will need at least two and a half hours, maybe a little more, with at least twenty five minutes resting time at the end. With about an hour to go, add some roughly chopped celery, carrot, onions and whole garlic cloves to the roasting tin, along with a couple of glasses of white wine. The veg will roast quite happily alongside the meat for the final hour. When the meat and veg are cooked, transfer everything to somewhere warm and make a thin gravy from the pan juices. Pour off most of the fat – there will be a surprising amount – and whisk in a scant tablespoon of flour. Add wine, stock, lemon, salt and pepper until you’re satisfied with the results. There is no special recipe for this, just go with what looks, tastes and feels best. The seasoning rub gives the meat a spicy kick, and helps to flavour the vegetables and gravy. The crackling is rich and crisp, the fat having rendered away during the slow roast. Serve with some kind of flat bread, a focaccia, maybe. Part of the point of doing something like this is for the leftovers. Please, nothing fancy – thinly sliced pork, good white bread, a dash of salt. 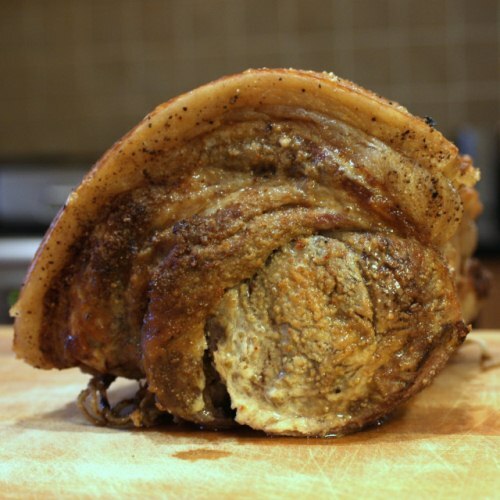 This is a very interesting rendition of porchetta, much more manageable than working with a whole suckling pig….